The federal agency announced Tuesday it is expanding its "Real Cost" anti-tobacco campaign to "educate rural, white male teenagers" and convince them to stop dipping. "Smokeless tobacco use is culturally ingrained in many rural communities," the FDA said. "For many, it has become a rite of passage, with these teenagers seeing smokeless tobacco used by role models, such as fathers, grandfathers, older brothers, and community leaders." An FDA spokesperson told the Washington Free Beacon that the total cost for the campaign is $36 million, which will be financed through taxes on tobacco manufacturers. Paid ads will cost $20 million, and the remaining budget will cover "research, strategic planning, creative development, and contract management." "Amplification of messaging from the campaign will take place at 25 Minor League Baseball stadiums throughout this summer using a variety of efforts, including sponsoring in-stadium events, the placement of print ads, running of television ad spots, and opportunities for fans to engage with players who support the FDA’s efforts on smokeless tobacco," said Tara Goodin, an FDA spokesperson. Chewing tobacco has been banned at ballparks in Los Angeles, San Francisco, and Boston, including Fenway Park, and major leaguers can face $250 fines and "are subject to discipline" from Major League Baseball’s Commissioner Rob Manfred if they dip during games. ESPN reported that signs are now posted in Fenway with a phone number so individuals can call to report on other fans they see chewing tobacco to "alert security." "This can can cause mouth cancer, tooth loss, brown teeth, jaw pain, white patches, gum disease," text on the ad reads. 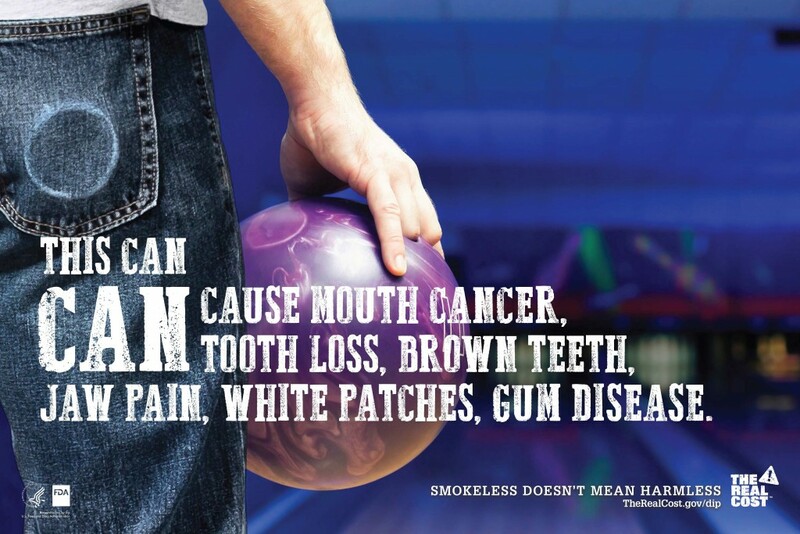 "Not only is the target audience using smokeless tobacco at a high rate, but many do not fully understand the negative health consequences of their actions," said Mitch Zeller, J.D., director of the FDA’s Center for Tobacco Products. "In communities where smokeless tobacco use is part of the culture, reaching at-risk teens with compelling messaging is critical to help change their understanding of the risks and harms associated with smokeless tobacco use." This entry was posted in Issues and tagged FDA, Government Spending, Tobacco. Bookmark the permalink.